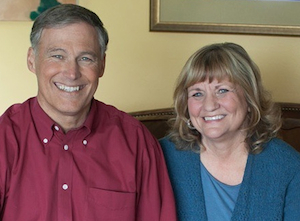 On Wednesday May 28 at 7pm, IslandWood hosts First Lady Trudi Inslee and retired Senator Phil Rockefeller for a climate solutions and energy strategy forum sponsored by the Sierra Club. Senator Rockefeller now represents Washington as a Council Member on the multi-state Northwest Power and Conservation Council. In this podcast, Phil Rockefeller describes to BCB’s Barry Peters the array of issues that are urgent to address in order to achieve energy efficiency, move beyond coal and create an energy strategy that is responsible to coming generations. As Senator Rockefeller explains, to address energy strategy, a key question is how to move beyond coal for the 30% of our electricity that now comes from that fossil fuel. In their description of the May 28 event, the Sierra Club points to the increasingly visible and pressing symptoms of climate change: crazy storms; drought; wildfires; rising sea levels; and ocean acidification. The Sierra Club notes that the latest science from the IPCC and National Climate Assessment Report confirm that greenhouse gas emissions — for example, from burning coal for electricity — is a significant driver of climate change. Senator Rockefeller explains that striving for energy efficiency and moving to renewable energy sources can strengthen our state economy and create green jobs. An additional speaker at the event will be Kellie Stickney, the community engagement specialist for the City of Bainbridge Island. 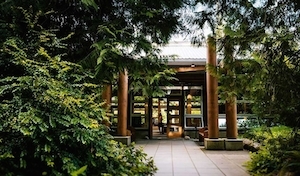 The Welcome Center at IslandWood. Site of the Wednesday May 28, 7pm, Sierra Club speaker event on Climate and Energy – Beyond Coal. The May 28 event is open to the public with no charge. Complimentary refreshments will be served. IslandWood is at 4450 Blakely Ave NE, on Bainbridge Island, WA. For further information, contact the Sierra Club. Credits: BCB Host: Barry Peters; BCB Audio Editor: Jeffrey Powel. Ferry/music intro: Dogfish Bay Studios. Synthetic music splash: Dave Bristow.